A viewer complained that the reference to 107 calories implied that Kit Kat was a healthy snack even though they believed the biscuit was high in fat and sugar. Another objected that the campaign appeared to target children through the use of Father Christmas, in breach of advertising rules on foods with a high fat, sugar and salt content. Nestle said the statement that the two-finger Kit Kat contained 107 calories was not a claim that it was a low calorie snack, or was low in fat or sugar, but was designed to help consumers make a more informed choice. It said the ad was of an adult nature and believed the concept of calories would hold little appeal for children. 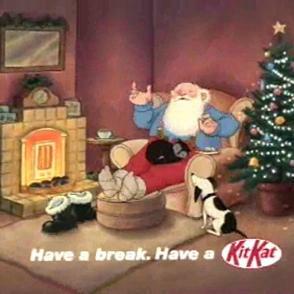 The Advertising Standards Authority said the 107 calories claim in the context of Father Christmas discussing having put on weight gave the misleading impression that a Kit Kat was low in energy. so it contains 107 calories…. but one just can’t say that….? gone be the days a bar of chocolate and common sense was just that.